The more I drive my car, the more I am convinced there is something amiss with the steering: in the straight-ahead position, the steering is quite heavy, and the further it is turned the lighter it becomes, to the point where nearing full lock it almost wants to take over. I could convince myself that there is some feathering on the tyre tread, although that is only marginal; I also get tyre squeal when I wouldn't expect it. You can alter the tracking with the excentric bolt (10 on the TAV) - I set mine up straight, neither toe-in nor out and am happy with how they run. Odd. Should be quite light straight ahead, very little loading in turning. Perhaps go get the car checked and see what all the angles are as is, and then see where to adjust. Toe-in seems like a good candidate to start with. ... I set mine up straight, neither toe-in nor out and am happy with how they run. That's interesting; the Handbook quotes '0÷2mm measured on the wheel rim', whatever that means. I interpreted it as toe-in of 2mm; maybe that should be 'up to 2mm'? I'll try it with zero toe-in and see what that's like. Not sure if this test works with sliding pillars on full droop - but with it jacked up can you push and pull on the tyre and spin the steering wheel? Am trying to think how else to isolate the steering box...more to inspire a more sensible suggestion than thinking this is "the way": pump the tyres up really hard and rest the contact patches on "milk bottle plastic". (I've found it to be good material for low friction washers). Anyone got a sensible suggestion? Last thought - adjust so there's a wee bit of free play at straight ahead on the assumption that someone's over done it? If the Appia steering box is the same general design as that of the Aurelia then there are two things you can do to improve steering feel and precision. The first is to disconnect the steering box from the steering arms and then rotate the steering wheel by one complete turn or maybe two then re-assemble. This moves the most worn area internally away from straight ahead. And then after having done that, if there is still play there is an internal eccentric adjustment one can do from underneath the steering box but be careful not to let the needle rollers fall out by using an O ring or rubber band to hold them up.. If this happens you will most likely have to remove the box from the car and re-assemble on the bench. Well, the saga continues ... The excessive toe-out was caused by a severely worn track rod end; needless to say, this did not want to leave its long-term residence, but I have eventually managed to dismantle the relevant components. I am not a mechanic, much less an engineer, but I must say I am not impressed - what a poor piece of design! 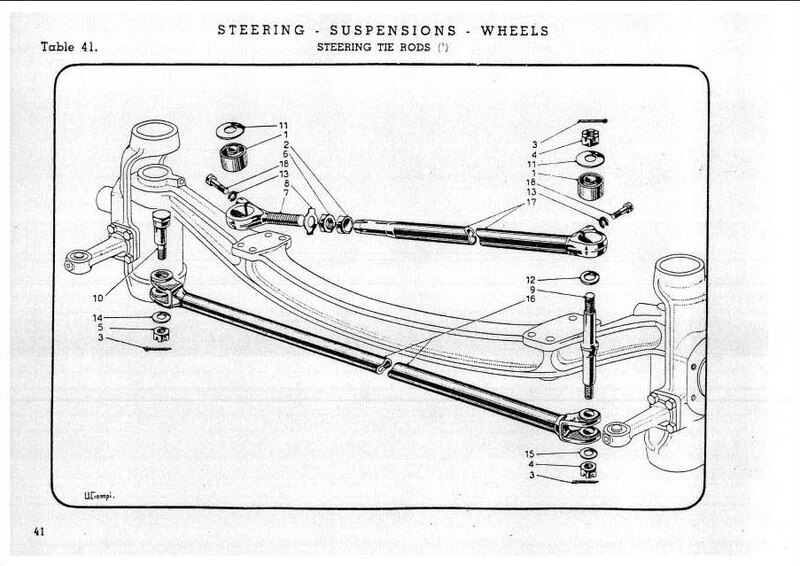 The ball joint bears on a concave surface on one side of the steering arm, but has only a sprung-loaded tube as bearing surface on the other; not only that, there is no provision for lubrication! Is this a common feature on all sliding pillar Lancias? If so, I am amazed there are any survivors! Anyway, the result is severe wear on the steering arms as well as in the ball joint itself. I have re-assembled with new bits from Jim just to keep the car mobile in the garage, whilst I await to see if Jim has any steering arms in better condition; however, I can now report that the steering feels even worse - amazingly heavy at any speed now. So presumably my next exercise is to investigate the steering box as per Simon's post above - how do I assess what is correct adjustment? MOT testers have been known to fail Appias because they don't approve of the design! If the spring loading is "strong", it will probably be OK, but if at all "weak", it probably won't be. Well, time to update this thread: new steering arms, new ball joints, new plungers and springs, tracking set to parallel, and at last the steering is something like it should be. It's still quite heavy with a rather dead feel, so perhaps there is still work to do on the steering box... Anyway, a first run down to the AGM produced a violent wheel shimmy at around 50mph It wasn't there before the work, so what could it be? It was obviously wheel balance, so I thought it must just be that I had refitted the wheels in a different position on the hubs. So this morning I spent an hour experimenting with the front wheels in different positions, without any significant improvement; I then did what I should have done in the first place, and just spun each wheel on the jack. One was fine, but the other was obviously very heavily out of balance, always returning to the same position. Further investigation revealed two lead washers on the inside rim in the offending position and, hey presto, removing them and the vibration has all but gone! It's not perfect, but it will do for now. The question is, why was it fine before the track-rod work - I have done around 6,000 miles since I bought the car five years ago with no problem - only for it to appear so suddenly? Ah well, who cares! Oh, and thinking about it, for the track rod ends to suddenly go like they did, I suspect I probably only needed to replace the plunger springs (both had disintegrated) but at least I now know everything is new. I found my series one always had a balance problem owing to the rolled rims, I changed to series two.